Sridhar Silberfein dancing on the stage during Jai Uttal’s set at Shakti Fest 2012. 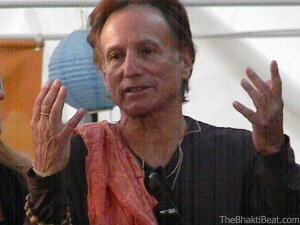 See full coverage of Bhakti Fest Midwest, Shakti Fest, and Bhakti Fest 2011 — links at the end of this article! If mantra music had a Man of the Year, Sridhar Silberfein just might be it. The founder of Bhakti Fest is taking his multi-day kirtan/yoga extravaganza on the road, venturing east from the chant-fertile grounds of SoCal for a locale with an altogether different vibe, smack dab in the middle of the American Heartland. Bhakti Fest Midwest hits Madison, Wisc. June 29 for four days of mantra-music bliss, in all its modern incarnations. Wait a minute, Wisconsin? A world-class kirtan and yoga festival in…Wisconsin? Go ahead and put aside any preconceptions you may have that the Midwest is no-man’s land — or maybe, no-mantra’s land? — for chanters. Kirtan is not just a “coastal” phenom exclusive to California or the Boston-NY-DC corridor. In true middle-American form, Heartland chanters have been quietly building a chant community and making a name for the Midwest on the mantra-music map. They got Bhakti Fest before the East Coast for crying out loud! Native Midwesterner Dave Stringer had a lot to do with that — he told The Bhakti Beat he’s been pushing for a Midwest fest for years, trying to convince people of the vibrancy of the Heartland chant community. Then there’s Milwaukee-based chantress Ragani; her monthly kirtans regularly draw 400 or more, and she has become a regional celebrity and media darling. Midwestern wallahs like Brenda McMorrow (okay, if Ontario was part of the U.S.) and Mike Cohen are making their mark on the national (and international, in McMorrow’s case) kirtan scenes, and regional-scene pioneers like Kirtan Path, Sitara and Kalyani with Pavan Kumar, DEVI 2000 and MaaShakti Das are popping up all across the plains. These are just a few of the bhakti bands with midwestern roots that will be holding the bhav at the Midwest Fest. It remains to be seen whether Sridhar Silberfein and the team he and daughter/producer Mukti Silberfein have put together can turn out the kind of numbers that have been drawn to the fall Bhakti Fest in Joshua Tree, Calif. (heretofore to be known as “Bhakti Fest West,” it seems), but that is not the expectation. Regardless of the final tally or the fest’s financial “success” (profits are divvied up among a hand-picked list of charities), Bhakti Fest’s march eastward strikes us like a game-changer in the kirtan world. UPDATE: About 1,200 people attended BFMW, according to Dave Stringer, and the fest will be back in 2013. Bhakti Fest has opened up a whole new super-size venue for mantra-makers, not just the “big acts” like Krishna Das and Jai Uttal, who can be assured of an audience of thousands, but also for up-and-coming chanters and complete unknowns seeking a larger audience for their music. It’s as if the floodgates have been opened: Sridhar told us he gets 10 to 15 CDs a day from wannabe Bhakti Fest wallahs. That’s a lot of wallahs looking for stage time, and one reason Bhakti Fest West goes all night AND has a second stage to showcase “new” talent (some of whom have been chanting for decades of course). Bhakti Fest is changing the festival scene too. Where once there was really just one big multi-day, multi-artist “chant fest” on the US scene (Omega Ecstatic Chant), there is now Bhakti Fest, Shakti Fest, Sat Nam Fest, Boston Yoga & Chant Fest, Bhakti Fest Midwest…and those are just the biggies. Regional kirtan festivals of various sizes are popping up all over too; witness Chantlanta in Atlanta, Rock the Bhakti in Sarasota, Fla., Philly Shakti Chant Fest, Moksha Fest in Santa Monica, Twin Cities Kirtan Fest, VerMantra in Montpelier, Vt., and on and on. And traditional yoga festivals seem to be opening to including more kirtan and mantra music in their “yoga-music” line-ups. Hanuman Festival in Colorado does this well, as did the first Tadasana fest in Santa Monica this spring. You will find at least one kirtan artist at most of this summer’s four Wanderlust fests, and if you’re on the right coast (the West one in this case), you might even find kirtan at a Yoga Journal conference (Dave Stringer will be in YJ San Diego in July, but not a wallah could be found at YJ-New York in April). The Mainstreaming of Mantra Music? In the bigger picture, we can’t help but get the sense that this kirtan thing is accelerating. The “mainstreaming” of mantra music is underway. It’s a trend arguably launched by George Harrison himself when his song, “My Sweet Lord,” topped the charts internationally and introduced an entire generation to the Hare Krishna Maha Mantra. Sanskrit chants have crept into popular music ever since, from Boy George to Tina Turner, and we’re seeing more and more chant musicians meld their mantras with modern beats, nontraditional instruments, and pop songs, to the dismay of some purists but the delight of many. Aside from the spiritual practice of chanting the names of the divine, mantra music is coming into its own as a musical genre. Mainstream media is even getting on the bandwagon…you’ve seen the stories about Snatam Kaur being summoned as the special surprise guest at Oprah Winfrey’s birthday party, right? We’ve also seen Ragani explain kirtan to Milwaukee morning television in 30 seconds flat, have watched Dave Russell chanting live on a Massachusetts newscast, and have witnessed the media frenzy surrounding the Holi Festival at the Radha Krishna Temple in Utah. Heck, even Fox News reported on it! Sridhar Silberfein didn’t start the fire (you’d have to go all the way back past George Harrison, past Srila Prabhupada, to the original 15th century kirtan revolutionary, Lord Caitanya, for that), but he is surely a modern torch-bearer for a movement that asks nothing less than the realization of the divinity within all. This weekend, he is riding the crest of the bhava wave right into the heart of the Heartland. The Heartland may never be the same. We’d love to hear your thoughts about whether mantra music is “going mainstream,” if that’s a good thing or not, and whether you perceive an acceleration of the kirtan movement. Please tell us what you think! 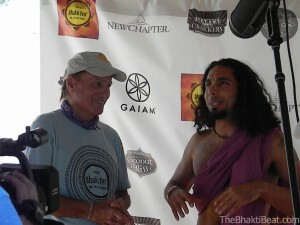 See our full coverage of Bhakti Fest Midwest! Do I perceive an acceleration of the kirtan movement? Are you kidding? 🙂 The first time I met Krishna Das at the Ashtanga Yoga Center in Encinitas, California there were about 25 people attending his kirtan. I immediately volunteered to do his bookings and PR (for free) because I KNEW it was the start of something big. How big it’s become was beyond anything even I could have imagined. Back in the days when KD was at Yoga Works in Santa Monica he had Girish, Dave Stringer and WAH in his band…among others. The demand for kirtan barely supported only a few kirtan wallahs in solo careers. Your article says it all about kirtan’s current status and where it’s heading. Thanks for your contribution! That’s very interesting Cathy — thanks for YOUR contribution! Sometimes I wonder if it’s just that I’m more aware of what’s happening as opposed to what is really happening in terms of change in the kirtan world, so I just need to check into the rest of the world and ask if I’m crazy or not, you know what I mean? 😉 Appreciate your feedback — and I love the story about KD! I’m curious, when did you first meet him? You are right! It is a mystcal movement and it is gaining steam and many many people have opened the way for this Festival and to make the midwest a welcoming place for kirtan. Not too far from Madison is a city called Chicago and volunteers and kirtan enthusiasts like Yoga Now Chicago owner Amy Beth Treciokas have for years been volunteering time and effort to create a landing pad for Krishna Das, Dave Stringer, Wah and others in the Midwest. I am please to have played a small part myself in this and also having written a story about kirtan and Krishna Das for TIME Magazine in 2003(?) 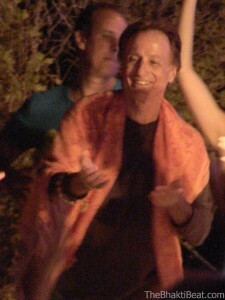 It was shortly after 9/11 and we heard the call to bring healing kirtan to the Midwest.Some of us dream of Chant Fest in Chicago – some day! Thanks for your comment Sally (and not just because you think we are right! ;). Amy Treciokas is opening the kirtan on Friday I believe, and I am looking forward to hearing her for the first time. Great to have the context you have provided. And we say Chicago Chant Fest ki JAIIIII! Can’t wait to hear when!! It was wonderful to hear all the history during BhaktiFest Midwest. What is clear is that Bhakti is a community activity and every action each of us takes builds and contributes to a greater whole. As Durga Das’ shirt said closing night: Whoever creates the most joy wins. Acceleration, yes! And why not? Feels to me like all of life is doing so. I love the way you described it, “It’s growing like a slowly cresting tsunami, building gradually but inevitably (to borrow one of Krishna Das’s favorite phrases), just like a perfectly executed chant.” I’ve explained it the same. Mainstream? Yes! Is it OK (with me)? Emphatically, YES! Why? Well… How could chanting the name ever be anything less than good, for the good of all? Will I personally resonate with every artist’s choice of expression? No. …that’s the JOY of the buffet! More to choose from, everyone finding their own deliciousness in the mix. Everyone finding their tasty morsel that feeds their soul and brings them to their knowing of ONEness with the Divine. No greater buffet, right? We moved back to our homeland, in the Heartland…back to Wisconsin. And I thought, oh boy…kirtan community is a thing of my past. I’ll sing with myself in my sweet little sanctuary of a house and that’ll be good. It’s all good. Little did I know that this area we call the Heartland with good reason (I’ve travelled all over and WI’s people, the people of the midwest have more genuine heart than any where else. OK, I may be slightly biased. But, you’ll see…), little did I know that this Chant Revolution was/is alive and well here!! Imagine my delighted surprise! Imagine finding that there are all sorts of beloveds right here, in WI, devoted, beaming in their brilliance, dancing by the light of their soul, chanting the name and being blessed in the bhava. I’m in heaven! Right here in Wisconsin. 🙂 …and the taste of heaven is getting sweeter day by day…thanks to Bhaktifest Midwest and more! Thanks for a powerful, passionate post, Brenda! Can’t wait for tomorrow (Friday, June 29th…day one of Bfest Midwest!!!). Thanks for your comment Gary! Looks like you’d better get your tickets to Bhakti Fest West — and get thee to “Sridhar’s Schwag Shack” (as we heard the girls manning it call it in the Spring) right off the bat to scoop up one of those Tee’s. Bhav on too!